Margie's Crafts: Rose Wonder by Stampin' Up! 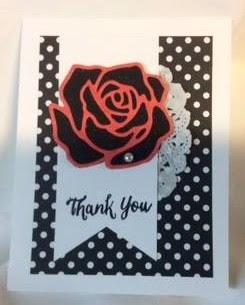 Rose Wonder by Stampin' Up! Here in Sacramento it is already 70 degrees and a few of the flowers are starting to bloom! 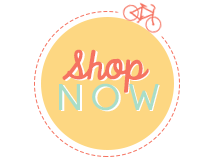 I love the flower stamps and coordinating dies that are in the Occasions catalog with Stampin' Up!. Thank you cards are another type of card that I ALWAYS have in my stash so I can immediately thank a kind person. 1. Fold Whisper White Card base and score at 5 1/2”. 3. Punch the 2 x 4 1/2” piece of Whisper White in the banner punch and glue about 1/4 of the paper doily to the back as shown. Stamp a sentiment from the Rose Wonder stamp set at the bottom and add to the card base. 4. Run the Watermelon Wonder piece through the big shot with the single rose from the Rose Garden Thinlits dies and glue the rose frame to the Basic Black piece with the Fine Tip Glue Pen. 5. Trim close around the edge so none of the black shows. 7. To finish the card, lightly brush the Wink of Stella Glitter Brush on the rose.